mijasper had built a really similar shunter MOC 14 years ago. I had no clue about that but now that I know it, I want to give him credits. I made 3 different color versions (there is a 4th one, but it's basically the same as the "dark blue / tan" one, just in "red / tan". All of them were used, and some are still used by the Deutsche Bahn. Also the model comes in 2 different width, on 6 studs wide (better for playing) and one with 8 studs width (looks better). I've built the red / light grey version with 6 studs width for my tracks. Btw., it comes with a 9V motor because a battery box would ruin the look. If somebody wants to build it with the old or new PF, I would recommend to use a seperate wagon to store the batterie box. 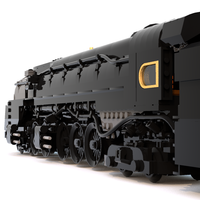 Please check out my Lego Ideas post for this locomotive (and my E103 Rheingold Express) and support it if you like it. Thank you so much! Great work, worth to be supported and I'm supporting this idea. Living in the Northwest of Stutgart I saw this loco nearly daily in operation. But sadly it dissapeared to the scrabyard. Nice engines! If it weren't for the blue background on the renders, I wouldn't be able to tell where the real prototypes end and the models begin! Wow I really like those designs, a definite support from me! Very good design ...I like this locomotive and you've done an amazing MOC! Here is my new own Lego creation, a german shunter locomotive. Oh ok. Actually I've never seen that one before. I've built the 6 studs wide shunter first without even had in mind an 8 studs wide one for a while. I've built a the 8 studs wide one because another guy told me it would look better. And you're right, it looks almost the same. I took my inspiration from 2 or 3 other MOCs for specific parts of the 8 studs wide shunter to be honest, but not from this one. Seems like you had the same ideas with nearly the same result or the other MOCs were I took my inspiration from took their inspiration from that specific MOC. That's a bit embarrassing for me now, cause I had no clue about that. But I think that's how Lego is. Some times people have the same ideas without knowing from each other. And with limited parts and building technics that can happen, especially when you build a model with Legos that exists in reality. Thank you for telling me. I hope you all don't mind if I still say that it's my creation because it is, but I will change my first post to give you credits. Seems like that guy had the same ideas with nearly the same result or the other MOCs were I took my inspiration from took their inspiration from that specific MOC. Thank you for telling me. I hope you all don't mind if I still say that it's my creation because it is, but I will change my first post to give that guy at least some credits. You are absolutely right about the above when it comes to "that's how lego is", but the other part of the hobby is being honest about where you took design ques from. For example, the way how you are using the flashlight piece as part of the railing is just a little bit too specific not to have copied. It's a typical Mijasper thing to use that piece, I'd say. Same goes for using grey instead of white. I think Mijaspers V60 is the only DB diesel I've ever seen that uses light grey instead of white for the all of the trimming. Oh, and the 1x2 "hook" brick you are using in the hood, and the recessed doors + railing. And again, yes, it's possible, and yes, you can have taken your design ques from other places, but that only makes me wonder more which the three other designs were you took inspiration from. In fact, if it actually is a MOD, it's a pretty nice update, using several pieces that 14 years ago just weren't available, and that you have correctly identified as being very usefull as subsitutions to make the model sleeker. *The problem here is ofcourse that you have posted it to Lego Ideas. Well, all I can say is, that I am absolutely honest in this case. Also I changed the topic to [MOD] and gave credits to mijasper in the first post. I'm really sorry for not checking if that design was there in the first place. I never expected to be that similar with another model getting inspiration from 3 other shunters, but not his one. For posting it on Lego Ideas: I would delete it now that I know that, but it's not possible. If you have any suggestions please tell me. Why does this even matter? If they guy says he knew nothing about the first guy's build, he knew nothing about it. Get over it guys. Well I can understand how they feel. And I'm not the guy to fight over something like that. He got a similar design first, so, also I didn't knew him or his build, I give him credit. What I really care about is getting Lego to build it, no matter who did the design first. I'm not fighting for getting credits. All I want is showing my designs to everyone, so everyone can build and enjoy them. The slipper slope of Lego plagiarism :P.
Yes. And yes again. Very nicely phrased @Redimus!